Editor’s Note: This is the second and final column of a two-part series on Tahiti. On a recent trip we spent hours grilling locals on their favorite restaurants, cafes and attractions. In the second of this two part series we’d like to share with the reader what we’ve found to be the best of Tahiti. When you first come to French Polynesia, the most obvious thing to hit you is the warm weather. People spend a lot of time outdoors which contributes to Papeete’s vibrant street life. There are a plethora of sidewalk cafes and “tea rooms” which serve pastry, fruit juice and treats of every description. These are also great places to rub shoulders with Papeete residents. Combining the atmosphere of an outdoor café with French food culture is surely something you should add to your Tahiti bucket list. We would start with L’Oasis at the Vaima shopping complex in the heart of Papeete. Specialties include homemade pastries, fresh juice and Carpaccio Javanese, thinly sliced ahi with a blast of Indonesian spices. The atmosphere is convivial and the downtown hubbub provides a great people-watching opportunities. We found Patisserie D. Hilaire in Papeete’s Mamao neighborhood (Avenue Commandant-Chessé) particularly good and a favorite of local friends especially when it comes to pastries. More than a coffee house, it’s really store with a wonderful array of produits gourmands including wine, breads, baked goods, ice cream, shakes, chocolate and the like. The vibe is friendly and the fare is worthy of any Paris establishment. We sampled an apple tart one afternoon that was baked to perfection. The fondant au chocolat eating with crème anglaise is mouth-watering. Les 3 Brasseurs is the only micro-brewery in town and is a great place to people-watch. While visiting French Polynesia you really need to dig into a crepe. It’s a traditional French offering and is quite popular in Tahiti. We have a couple of favorite places to suggest. The first is an un-presumptuous spot simply called Yummy. Located off the sidewalk opposite the imposing Cathedral Papeete, they have an array of picnic table type seating beneath a canopy. Classic crepes are the specialty but they also serve galettes (a crepe made with wheat flour) as well as smoothies, salads, fish and the like. Another option for wonderful crepes is Snack Vaimiti on Toata Square in Papeete’s Paofai neighborhood. It’s very local and modest with outdoor tables and plastic chairs. Odds are you’re not going to find tourists here. The fare is inexpensive (crepes are around 800 cfp) and good quality. I found it an excellent place to connect with denizens of Papeete. 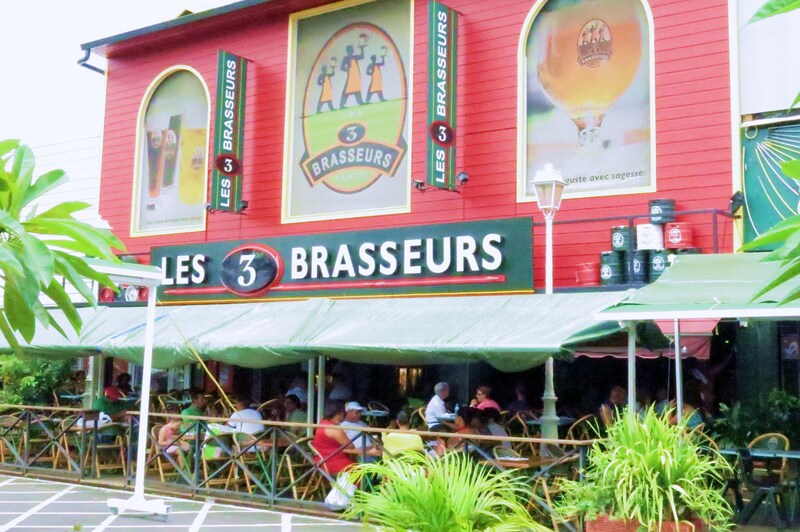 If your pleasure includes a bite to eat, a beer and people watching along along Boulevard Pomare (the main drag in town) you’ll do no better than Les 3 Brasseurs located near Prince Hinoi street. It’s a classic sidewalk café but it’s also a microbrewery that produces a variety of beers. While there we had a delightful amber Christmas brew. The culinary specialty of the house is flammekueche, a pizza-like dish (with no tomato sauce) made with unleavened bread. It’s not at the same standard of the flammekueche you’ll find in Strasbourg but it’s passably good. You can also order sauerkraut, hamburgers and other “bar” food. 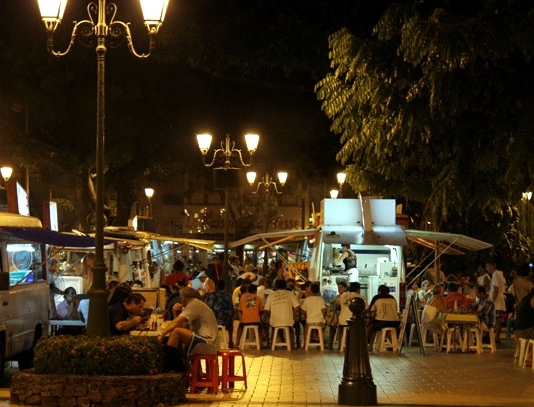 Vaiete Square, comes alive at night with a plethora of roulottes, that offers every type of cuisine. You can’t visit Tahiti without stopping here. Meals on wheels anyone? Dine at the best roulottes in Papeete. Vaiete Square, where the cruise ships dock, is also the traditional venue for the roulottes the vans (some of which) serve the best inexpensive food in town. Even if you’re not planning to dine, just making the scene is an obligatory part of the Papeete experience. Some of the roulottes owners have put a great effort into decorating their vehicles, by adding neon signs or ornate paint jobs to advertise their fare. Roulottes dole out grilled chicken, steaks and fish piled high with pommes frites, omelets, chop suey and even pizza. Vaiete Square really comes alive in the evening (although there are a few vans open during the lunch hour). The recent renovation of the area has transformed it from a glorified parking lot to a landscaped plaza, tiled with flagstones and illuminatated with fancy fin de siècle style street lights. The “Square” is covered with tables and there’s even a sound stage where you may be serenaded by ukuleles and guitar. Generally the food is quite decent but some places are indeed better than others. It’s obligatory to survey the scene before you settle in to see which roulette is attracting patrons. For local fare check out Chez Mamie which serves the traditional poisson cru (marinated fish in coconut milk) and other local favorites. Bring back some cool omiyage. Locally produced monoi oil (and soap) is a great gift to bring back. Of course there’s always the pareo, carved tiki and the kitschy shell necklaces but you can certainly do better than that. 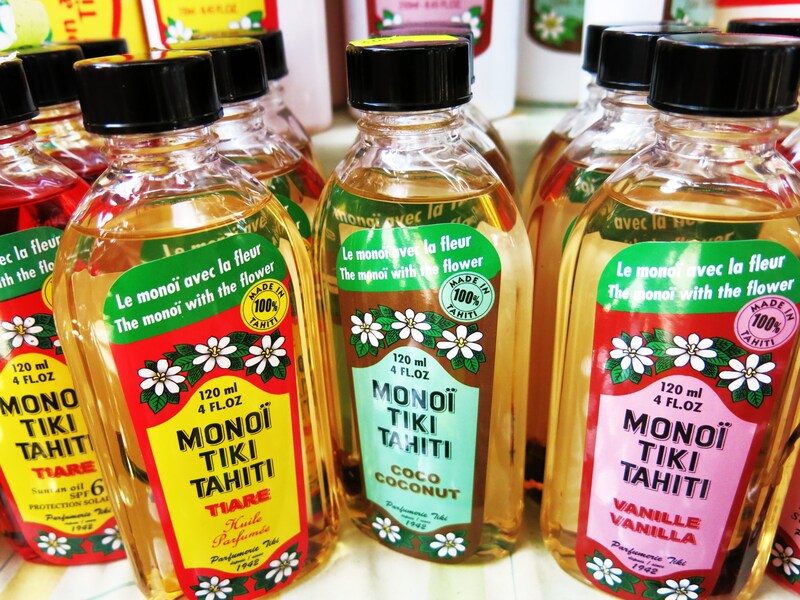 Here’s one suggestion for an inexpensive omiyagi: Tahiti is famous for its monoi oil, soap, shampoo, body cream and other items derived from dried coconuts. Monoi is a blend of the extracts of two plants—the Nucifera coconut and the fragrant tiare flower (Gardenia tahitensis). Tahitians and other islanders have used the oil for centuries as a salve or moisturizer. The homemade version (which you can pick up at a public market) is amber or live colored liquid usually refilled in soda bottles or medicine flasks. You can pick up the oil for about 350 cfp per bottle at the public market in Papeete or at any of larger retail stores around town such as the Carrefour chain of supermarkets. The oils and soaps come in a variety of wonderful aromas such as Pitate, coconut, Santal (sandal wood), Ylang Ylang, Vanille, etc. The scented soap goes for around 200 cfp per bar. Another gift item is the locally grown vanilla. The cheap vanilla you get in your neighborhood supermarket is synthetic and doesn’t hold a candle to the real thing. According to chefs, such as cookbook author Marian Getz, Tahitian vanilla is vastly different from varieties grown in Mexico or Madagascar “in the most wonderful way”. (She was first introduced to it by celebrity chef Wolfgang Puck. It’s evidently his favorite and the one used in his restaurants). To prove her point, she suggests a side-by-side smell test with the Tahitian vanilla and the Mexican or Madagascar products, but we’ll take her word for it. You can get souvenir, cigar-style bottles of vanilla all over town or for more options, you can go to the Vanilla Market, located near the Socredo Bank on rue Paul Gauguin (off of Blvd. Pomare). It has a variety of vanilla products–oils, perfumes, beans, extracts, powder, etc. Good quality products are available but they are very pricey. For example a 100 gram packet of vanilla beans were about $50. A better bet, if you have the time, is to take a taxi down to Epic Vanille. Tell the driver you want to head to the Hipodrome (racetrack) in Arue. Look for the “Development Rural” offices on the right hand side of the road, heading inland. Call them directly at 50.89.50 for info. For best prices and larger quantities, this is the place to go. 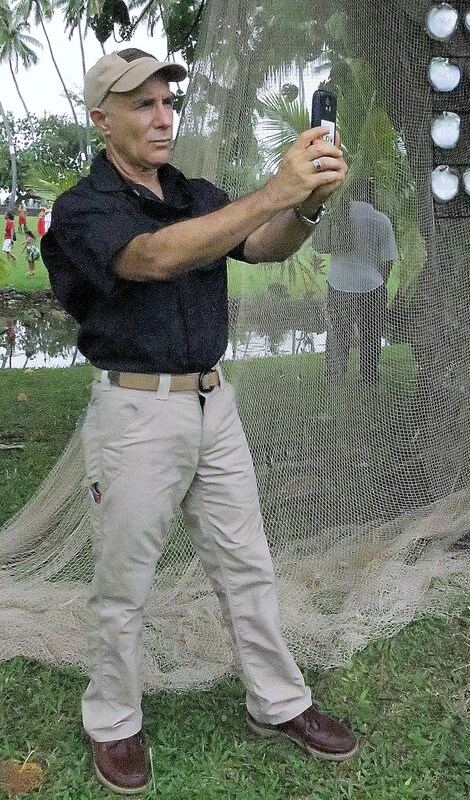 The author is wearing a Kitanica shirt and pants (with a cotton blend) that works great in the tropics. Source from the livecasinosites.com live dealer casino websites, You can stay connected to friends and family in Hawaii by utilizing wi-fi in French Polynesia. Tahiti is now connected with a fiber optic cable to the rest of the world via Hawaii. The good news is that quality of calls are now terrific–much better than the old fashioned satellite link. The bad news is that the state-run phone company still charges predatory, pre-Internet prices for long distance calls. We got whacked for about $175 in calls to Australia at almost $5 a minute. One solution: If you’re calling back to Hawaii or anywhere in North America there is a way to save money. T-mobile allows for free calling to anywhere in North America over it’s wi-fi phone. Skype can also be used free of charge in and out of Tahiti. French Polynesia is magnificent but it can be wet, humid and warm. As we mentioned in part one of this story, bring plenty of mosquito repellent. A pair of sturdy shoes and light durable clothing that will not rumple in your bag are also important. Over the past year or so we’ve become a big fans of the Kitanica line of clothing which is perfectly suited for the tropics. Their LWV Short Sleeve Shirt comes in basic black and looks cool enough to wear to a cocktail party. Made with a combination of light, but sturdy polycotton ripstop, it provides “breathability”, which in Tahiti is not some abstract concept. The LWV does that and offers the wearer a full range of motion. And….you actually may even smell better wearing this shirt. The material has an antimicrobial moisture component in the mesh underneath the armpit. The Kitanica Backcountry pants, made from a 50/50 cotton-nylon blend, are also excellent for Tahiti’s climate. They are very robust and sport beefy nylon belt loops, an industrial strength zipper and are reinforced in the okole and knee. They are tailored to effect a slim profile. Price for the shirt and pants are in the $100 range. Hawaiian Airlines flies to Tahiti weekly, departing Saturdays at 3.30 p.m which gets you into Papeete around 9.30 pm. The return flight departs Papeete around midnight gets into Honolulu Sunday around 6 a.m. The route is very popular with Tahitians who come in large numbers to Hawaii primarily to shop. (Been to the Costco at Mapunapuna lately? Tahitians spend big money there). Other than Tahitians, inbound passengers appeared to be a mixture of Mainland people, Europeans and Hawaii residents. 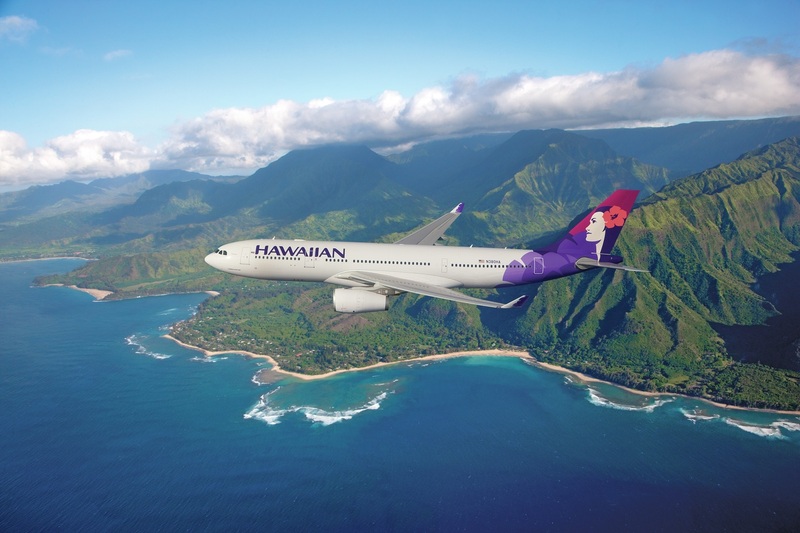 Hawaiian Airlines has the sole route to Tahiti via Hawaii. You’ll get there on a new Airbus A330-200. Hawaiian’s service to Tahiti was excellent and the vibe on the airplane (a brand spanking new Airbus A330-200) felt very “local”. All the flight attendants are Honolulu-based and airborne, and being on the plane feels as if you never left Oahu. The free glass of wine in coach was an unexpected plus. The Airbus had video screens at every seat. Price for round trip fares out of Honolulu begin at $697 based on availability, when purchased 60 days in advance. Conclusion: Tahiti is our closest island neighbor. Even though it’s the very source of Hawaiian culture, for most Hawaii people it’s terra incognita–unknown and unexplored. Tahiti is demographically 85% Polynesian and the Tahitian culture positively dominates the place. For those interested in seeing a completely different side of Polynesia, where the language and culture are very much alive, you need to experience this place up front and personal. Given the cultural similarities and long affinity between French Polynesia and the Aloha State, I believe Hawaii people would feel exceedingly comfortable visiting Tahiti. Tahitians are welcoming and Hawaii residents are in a position to understand the Mahoi culture in a way that Mainlanders would probably not. It’s also easy for a Hawaii resident to adjust to Tahiti. The climate is essentially the same as Hawaii and Tahiti shares our time zone. Our advice to local people is take advantage of the Hawaiian’s route. You’ll get a taste for Polynesia that will bring you back again. Rob Kay is the author of Lonely Planet’s Tahiti and French Polynesia, a Travel Survival Kit and Hidden Tahiti pubiished by Ulysses Press. For questions or comments contact him at rkay@fijiguide.com. Philippe Guesdon, former editor of Les Nouvelles de Tahiti and Tahiti correspondent for Le Monde, has been a resident of French Polynesia for 40 years. He can be reached at flip@mail.pf. Thanks for your sharing, i think this article must beThanks for your sharing, i think this article must be share to other people. http://www.buydianabolsonline.com/ share to other people. This article defiantly has my vote! Great work. I agree with your blog. I have expressed similar opinion in my blog. Thanks! Some students are so talented and always do the challenges to others just like exams marks and win the race etc. When any student wins the challenge then increase the passion and also confidence level is also increase.